Space shuttle Endeavour begins its slow move from High Bay 3 in the Vehicle Assembly Building to Launch Pad 39A at NASA's Kennedy Space Center in Florida. HOUSTON – Six astronauts are almost ready to fly NASA's space shuttle Endeavour on one last mission – a space voyage slated to blast off on April 19. Endeavour is slated to fly to the International Space Station, where it will deliver a $2 billion astrophysics experiment to detect cosmic rays from space. The mission will be the second-to-last orbiter flight before NASA retires its 30-year space shuttle program for good. "This is my fourth flight to the International Space Station on the space shuttle," Kelly said today (March 24) at a press conference here at NASA's Johnson Space Center. The shuttle has "been an incredible success over a long period of time. It's sad to see it go." Kelly has been juggling space shuttle training while caring for his wife, Congresswoman Gabrielle Giffords, D-Ariz., who was shot in the head by a constituent in January during an attack at a Tucson grocery store that killed six people and injured 13 others. Kelly made the difficult decision in February to resume training with his crew and push on with the mission despite his wife's injury. He said today that she has been improving every day and credited his experience as a veteran of three space missions for helping him get through the grueling training schedule. Riding along with Kelly on Endeavour's STS-134 mission are pilot Gregory H. Johnson, who piloted Endeavour on the orbiter's STS-123 mission in March 2008; mission specialists Michael Fincke, who has served two long-duration stints living and working onboard the International Space Station; Greg Chamitoff, who has logged a total of 183 days in space; Andrew Feustel, who was a member of the shuttle Atlantis' STS-125 mission in May 2009; and European Space Agency astronaut Roberto Vittori, who has flown twice before to the space station. Endeavour's primary payload is a science experiment called the Alpha Magnetic Spectrometer (AMS), a particle detector 16 years in the making that will analyze particles called cosmic rays for what they can tell us about the origins and makeup of the universe. "It's going to be facing out into the heavens and see what it can see," Fincke said. "We're just looking forward to seeing what it shows." In addition to the AMS, Endeavour will also carry a container of spare hardware and science experiments to help the space station continue running smoothly after the space shuttles retire. 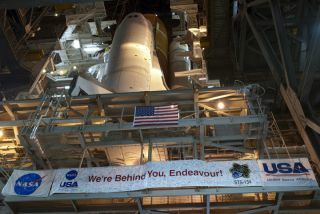 Endeavour will be prepared for permanent display at a museum after it returns to Earth from its final mission. NASA administrator Charles Bolden plans to announce where the three space shuttle orbiters will be retired April 12. "Of course the last flight of each of these vehicles is bittersweet for all of us," said Gary Horlacher, the lead flight director for Endeavour's STS-134 mission. "Certainly it's going to be a bittersweet moment to see it back on the runway" after it lands at NASA's Kennedy Space Center in Cape Canaveral, Fla.
After Endeavour's STS-134 mission, NASA has just one more space shuttle flight planned. The STS-135 mission of the shuttle Atlantis is slated to launch June 28, as long as NASA receives the necessary funding. "It looks like the budget is lined up to support that mission," said John Shannon, NASA space shuttle program manager. "Atlantis is being processed. From a program standpoint it looks like we're going to go fly that mission." Atlantis will carry four astronauts and a huge haul of spare parts to the space station. No spacewalks are planned for that mission, making STS-134 the last time space shuttle astronauts will ever perform a spacewalk at the station. Mission specialists Fincke, Feustel and Chamitoff will conduct those excursions. "I'm just really excited to be able to go outside with Greg and Mike and share some great experiences and get some amazing views," said Feustel, who was also on the spacewalking team during NASA's final mission to the Hubble Space Telescope in 2008. "We hope to take some spectacular photos while we're out there." After the AMS is installed, NASA will have no major pieces of new hardware to attach to the International Space Station, which is now officially complete from a U.S. standpoint. However, NASA plans to continue operating the orbiting outpost until at least 2020, and mission managers won't rule out the possibility that future additions to the station could be planned. "One of the beauties of having a space station is it has the ability to expand and change," said Kirk Shireman, ISS deputy program manager. "There's certainly the capability to add more modules. We have the ability to evolve over time and adapt and I hope that’s what we'll do."